The results were presented on April 15, 2015 at the Press Club of the Bulgarian News Agency, Sofia. The aim of the audit, which AIP performs via an online platform since 2010, is to evaluate how the executive bodies fulfill their obligations for proactive publication of information online under the Access to Public Information Act and other legal regulations and to assess their readiness to respond to electronic requests. The focus of the 2015 Audit on institutional web sites is on Budget, Financial Transparency and Integrity, updating the audit indicators in line with the new obligations introduced by the amended Public Procurements Act. The 2015 audit was performed within the period 23 February – 23 March 2015 by eight reviewers from the AIP team. 544 web sites of 544 executive bodies at a central, regional, and local level, and also public-law entities and independent state bodies were reviewed and assessed on the base of 72 (81 for the municipalities) indicators. 542 electronic requests were filed. AIP sought copies of the orders assigning the information officers within the respective public bodies and their job descriptions. statistics on the responses to the requests. The level of transparency was evaluated on the base of updated 72 (81 for the municipalities) indicators. The possible total was 81.4 (88.4 for municipalities). Comparative 2013, 2014 and 2015 Ratings allow for a review of the active transparency development in Bulgaria. 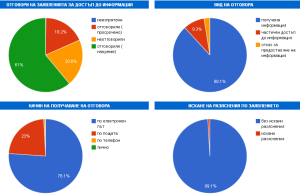 2015 Budget, Financial Transparency and Integrity Map of Municipalities of Bulgaria was updated to illustrate the fulfillment of obligations for online publication of budgets, financial reports, information under the Public Procurements Act, and information related to public officials’ integrity. The web based auditing module allows for the generation of different types of ratings – by type of public body, by administrative region, regional structures and their principal ministry. In the lack of a public body to coordinate and control the implementation of the APIA, including the obligations for proactive publication of information, the AIP Audit serves as a model publication scheme for public bodies to increase their active transparency. Analysis of the results will be included in AIP annual report Access to Information in Bulgaria 2014-2015 which is to be released in May 2015.